This is a cinema with "museum" in its very name. It has the special status of an archive cinema. It falls under the care of the National Film Archive which – in line with its slogan "Film Memory" – protects Poland's film heritage and restores it to Polish culture. ILUZJON belongs to the Arthouse Cinemas Network. ILUZJON is valued for its ambitious repertory – a combination of classics and new releases – and its selection of exceptional film events: special screenings, Q&As with filmmakers (Mike Leigh, Jiři Menzel, Krystyna Janda, Jerzy Stuhr, Jerzy Hoffman), multimedia exhibitions, screenings with live music (Silent Movie Festival), festivals and reviews (Docs Against Gravity Film Festival, the Watch Docs International Film Festival, Human Rights in Film, Sputnik over Poland – Russian Film Festival, Festival of Jewish Culture in Warsaw, The Unknown Faces of Japan, a review of films nominated for the "Eagles" – the annual awards of the Polish Film Academy), repremieres of digitised and digitally restored pre-war films with live music ("Pan Tadeusz" (1982) – dir. Ryszard Ordyński, music by Tadeusz Woźniak; "Zew morza" [The Call of the Sea] (1927) – dir. Henryk Szaro, music by Krzesimir Dębski) or gala premieres, for example, the digitally restored work by Jerzy Hoffman in the new cut – "Potop redivivus" [The Deluge Redivivus] (2014). The cinema's repertory includes film cycles for a wide audience, including Kino od Kuchni [Cinema Backstage], I Love Polish Cinema, Kultura Dostępna [Culture Available], Młodzi Gniewni [Angry Youth], Mały Iluzjon [Small Iluzjon] and Klub Seniora [Seniors' Club]. The Iluzjon is available for a variety of special events: film premieres, award galas, conferences and symposia. After its renovation on a high European level, the cinema maintained its excellent programme and highly positive reviews. Where else can we see on the big screen "Bleak Moments" by Mike Leigh or "Even Dwarfs Started Small" by Werner Herzog? 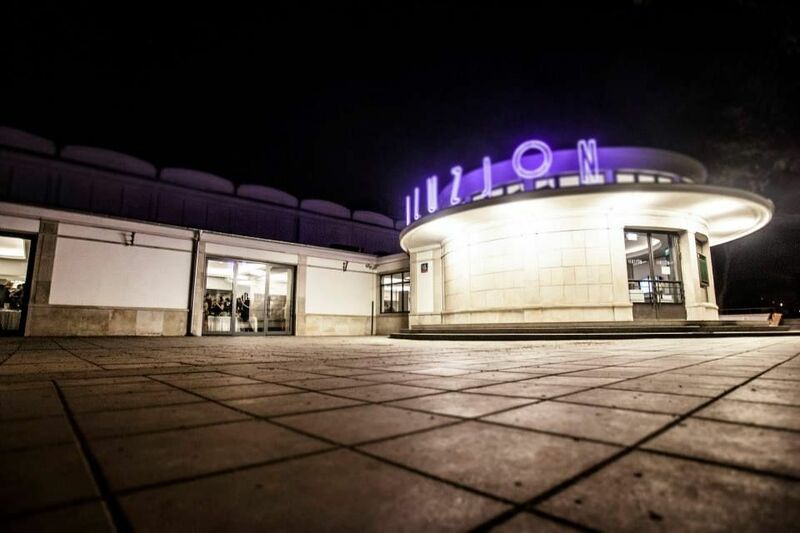 Seasoned cinemagoers will not be deterred by the ILUZJON's lack of popcorn, but they will rather be attracted by the unrivalled programme, attractive ticket prices, the friendly surroundings of one of Mokotów's green squares, the proximity of a metro station and the Iluzjon café. Before the then 60-year-old ILUZJON was turned into the multimedia Museum of Film Art – a modernised two-room facility equipped with the most modern projection devices (with the possibility of playback of formats from 16 mm to 3D) – it had often moved location. Its current headquarters in the Mokotów district at 50A Narbutta St. (in the historic building of the former Stolica [Capital] cinema) were only acquired in 2009 with the support of the Ministry of Culture and National Heritage. The ILUZJON owes its special status as an archive cinema to the fact it belongs to the National Film Archive, which has one of the largest collections of film archives in Europe. The National Film Archive, following the provisions of its Statute and also the Statute of the International Federation of Film Archives (FIAF), to which it belongs, carries out activities to disseminate film culture to a large extent through the ILUZJON cinema. Since 1956, almost from the beginning of the National Film Archive's operations, under the banner of the ILUZJON cinema, hundreds of reviews, festivals and other film events have been held in various buildings rented or made available for use by their owners. ILUZJON started its operations in March 1956, as the "Iluzjon" club at the National Film Archive in Warsaw. Then it was based in the Kultura cinema at 21/23 Krakowskie Przedmieście St.; then from 1957-1960 in the building of the Cabinet Office at 14 I Armii Wojska Polskiego Ave. (currently Szucha Ave.); in 1961, it operated part-time at the now-defunct Aurora cinema at 7 Kredytowa St., belonging then to the Society of Polish-Soviet Friendship; in January 1963 the cinema resumed its regular activity in the Sala pod Kopułą [Under the Dome] Hall at 5 Trzech Krzyży [Three Crosses] Sq., where it operated for 10 years; in 1974 the ILUZJON was open in the Polonia cinema at 56 Marszałkowska St.; from 1984 it had its seat in the Śląsk [Silesia] cinema at 4 Wspólna St., where it stayed the longest (until 1996, when the Minister of Construction terminated the lease agreement with the National Film Archive. At the news of the closure of the ILUZJON, along the streets of Warsaw there was a demonstration of several hundred students from Warsaw University and local residents demanding the decision be reversed). In 1997, the National Film Archive acquired new headquarters for its cinema in the former Stolica [Capital] cinema located in the Mokotów district. In December 2008, thanks to the determination of the authorities of the National Film Archive and subsidies from the budget of the Ministry of Culture and National Heritage, the historic building (previously entered into the National Register of Historical Monuments) at 50A Narbutta St. was purchased from MAX-FILM S.A. Since January 2009, due to the preparations for the modernisation of the building at Narbutta St., the ILUZJON cinema temporarily operated in the Stefan Demby auditorium in the National Library at 213 Niepodległości Ave. in Warsaw. On 27 April 2011, the National Film Archive signed a contract with a general contractor for construction works under the investment project "Adaptation and reconstruction of the historic building of the Iluzjon cinema – Museum of Film Art at 50A Narbutta St. in Warsaw for the needs of the National Film Archive." On 9 November 2012, operation of the modernised ILUZJON – MUSEUM OF FILM ART resumed successfully with the symbolic gesture of the switching on of its front neon sign by the then Minister of Culture and National Heritage, Bogdan Zdrojewski. On that day, exactly 84 years after its premiere, there was a celebratory repremiere of the digitally restored blockbuster from the 1920s – "Pan Tadeusz" (dir. Ryszard Ordyński, 1928) with live music by Tadeusz Woźniak. Polish President Bronislaw Komorowski was the honorary patron of the event. The building at 50A Narbutta St. was designed in 1948 as the Stolica [Capital] cinema by Mieczysław Piprek (built in 1949-1950). The same architect also designed other Warsaw cinemas such as the W-Z (the East-West cinema in Wola), the 1 May (in Grochów) and the Ochota (currently the Och-Teatr in the Ochota district). These four cinemas are examples of modernist architecture flirting with socialist realism. Along with the surrounding area (the Antoni Słonimski square), the ILUZJON has been entered in the register of historical monuments. The cinema is a one-story detached building made from irregular blocks, built on a rectangular plan with a distinctive rotunda added on its southern side. The original interior fittings of the Stolica [Capital] cinema – e.g. the fabric on the walls (the "Columns" jacquard designed by Zofia Matuszczyk-Cygańska made by the famous "Ład" [Order] Artists Cooperative at the turn of 1948 and 1949), plaster cartouches, i.e. bas relief variations on the crest of Warsaw (the Warsaw "Mermaid"), or the elements of pilaster strips and cornices – were subjected to restoration work following a prior inventory of the original patterns. Aleksandra Kot designed the new ILUZJON neon sign. As a result of the restoration, the ILUZJON building retained its original features and gained in functionality. The adaptation and reconstruction of the ILUZJON was designed to standardise the building in technical terms, restore it to its former glory and upgrade its overall standard. The investment was designed to expand the usable space of the building – by turning the one-room cinema into a multi-purpose building. As a result, there are now two projection rooms: the Stolica [Capital] room (with 263 seats, including 2 seats for people in wheelchairs), with a stage in front of the screen along with the orchestra pit, and the Mała Czarna [Small Black] room (with 47 seats, including 2 seats for people in wheelchairs) – both rooms are equipped with modern audiovisual equipment that supports both traditional and modern multimedia technology. In the renovated building, a café was opened and there was also a space dedicated to multimedia exhibitions (monitors in the rotunda of the cinema allowing interactive exhibitions, displays in the main foyer and the Video Wall – 12 seamless screens – in the small foyer) which enabled the National Film Archive to present its collections in a modern way. The multi-functionality of the venue created new possibilities for organising large-scale cultural events such as film festivals, retrospectives, meetings with artists and cultural practitioners and hang-outs (group conversations via the Internet), workshops, film premieres and many other activities. The renovation of the cinema was financed by the Ministry of Culture and National Heritage. The ILUZJON's repertory is mostly film classics presented in thematic cycles, retrospectives and reviews. We believe that the history of cinema is constantly changing, which is why the programme is not short of new releases (modern ambitious titles) and documentaries. With a nod to old traditions, selected screenings are preceded by the Polish Film Chronicles. We don't forget about the younger audiences either – they are invited every Sunday to the "Mały Iluzjon" [Little Iluzjon]. We also run educational programmes. Many of the events are the result of good cooperation with partners such as the Goethe-Institut, the British Council, the French Institute, the Italian Institute of Culture, the Danish Cultural Institute, the Romanian Cultural Institute and the Czech Centre, through which we obtain the most interesting film titles from all over Europe, many of which have never been distributed in Poland before. The ILUZJON has collaborated with such festivals as AfryKamera and Film Summer. It currently hosts the most interesting film events on the cultural map of the capital: the Millenium Docs Against Gravity Film Festival, the Łodzią po Wiśle [Boat on the Vistula River] Film Festival, the Watch Docs International Film Festival. Human Rights in Film and Sputnik nad Polską [Sputnik over Poland – Russian Film Festival]. The cinema also holds screenings of films nominated for the Polish Film Awards – the "Eagles" – as well as the Awards of the PSC (Society of Cinematographers). It is also the aim of the cinema to talk about the history and language of cinema. Over the years, the ILUZJON has hosted many artists of world cinema, including Werner Herzog, Ulrike Ottinger, Doris Dörrie, Volker Schlöndorff, members of the Monty Python group, Lindsay Anderson, Alan Parker, Vilgot Sjöman, Jan Troell, Ken Russell, Jean-Jacques Beineix, Inna Churikova, Anastasiya Vertinskaya, Karen Shakhnazarov, Jiří Menzel and Mike Leigh, as well as the most outstanding Polish filmmakers: Andrzej Wajda, Krzysztof Zanussi, Marek Koterski, Piotr Dumała, Dorota Kędzierzawska, Marcel and Paweł Łoziński, Krzysztof Krauze, Maciej Pieprzyca, Bodo Kox, Janusz Zaorski, Andrzej Jakimowski and Jerzy S. Stawiński. The review of films nominated for the "Eagles" award is a great opportunity for interesting meetings with Polish artists. To date, we have hosted, among others, Agata Kulesza, Agata Trzebuchowska, Dawid Ogrodnik, Piotr Głowacki, Marcin Krzyształowicz, Adam Bajerski and Wojciech Mecwaldowski. The Kino od Kuchni [Cinema Backstage] cycle gradually unveils to the audience the secrets of the subsequent stages of the film production process. We show the mechanisms of creative processes, artistic activities and technological treatments that make up a film production. The guests of the screenings are the co-creators of the works, who bring the audience closer to certain aspects of the productions. To date, the audiences of the ILUZJON cinema have had the chance to meet as part of this cycle such artists as Jarek Barzan – editor of the film "Lęk wysokości" [Fear of Falling] (dir. Bartosz Konopka, 2011), Jacek Hamela – responsible for the sound layer on the film "Imagine" (dir. Andrzej Jakimowski, 2012), DoPs Piotr Sobociński Jr. and Arkadiusz Tomiak, winner of a PSC award for cinematography for "Obława" [Manhunt] (dir. Marcin Krzyształowicz, 2012), writers Maciej Karpiński and Józef Hen, as well as the storyboard artists for "Wymyk" [Courage] (dir. Greg Zgliński, 2011) – Mateusz Rakowicz and Greg Zgliński. Kino od Kuchni [Cinema Backstage] is a joint initiative of the National Film Archive and the audiovisual industry magazine "FilmPRO". Since 2003, we have been organising at the Iluzjon the original film and music event called Święto Niemego Kina [the Silent Movie Festival]. Screenings of silent films are accompanied by music (jazz, classical, club and experimental) performed live. The festival has featured, among others, Urszula Dudziak, Maciej Maleńczuk, Leszek Możdżer, Stanisław Soyka and Aga Zaryan and such groups as Pink Freud, Pustki, Myslovitz and Voo Voo and the world famous silent film piano accompanist Antonio Coppola. Junior and senior high school students are invited to participate in multimedia lectures with film screenings. This is a great opportunity to learn about the achievements of the greatest motion picture artists. The latest news about the ILUZJON and its current repertory are published on the cinema's website, on printed leaflets distributed around Warsaw and in programmes available in the cinema. We also invite you to ILUZJON's profile on Facebook. Glimpses of the key events are also presented in the monthly video teaser of the cinema's repertory on iluzjon.tv.